Convection currents are caused by a temperature difference in gases and liquids. As one area becomes warmer than another the molecules have more energy and start vibrating more vigorously thus spreading out and becoming less dense. This means that the less dense parts will become more buoyant causing them to rise. Convection is one of the main reasons why we have wind. As warm air rises and cool air drops it creates currents of air in the form of wind. A hot air balloon rises for the same reason because it containers hot air which is less dense than the surrounding cool air so it rises. means that natural convection can only occur in the presents of a gravitational force. In 'Outer Space' which is near gravity less environment if you were to light a match, provided there is oxygen, the match would put itself out. This is because without gravity the hot gases from the match don’t rise up they spread out in all directions, thus the flame suffocates in its own waste. Here on earth the hot used up gases from the flame would rise and be replaced by cooled air which still contains oxygen so the flame can continue to burn in a continuous convection current. Forced convection can be caused by pumps and fans which force the gas or liquid to circulate. Forced convection is used in convection ovens to cook food faster and more evenly. Though convection happens naturally in normal ovens it does not get the air moving as fast and thus the food is not as quickly cooked as in a convection oven. Gravitational convection a.k.a. buoyant convection is not due to temperature difference within a gas or a liquid. It is caused when one material is more buoyant than another causing it to rise and the other to fall. This means that this sort of convection also needs a gravitational force to be acting upon. 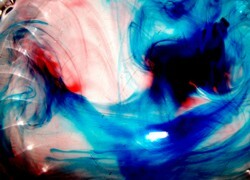 Natural convection currents in water are easily observed with a drop of dye. If you heat up a pot of water the water will start to move as the hot water from the bottom of the pot rises and the cool falls. This would actually make a cool little easy science experiment. Just heat up a pot and put in a drop of food then time how long it takes to colour all the water and observe how it does so because you can actually see the currents. Go back from "Convection Currents" to home.